Ms. Celiac Says...: Why Not Bake A Cake? As was recently featured in the New York Times, the American Cancer Society asked students at the Culinary Institute of America to reinvent the classic birthday cake using healthier ingredients. One of the four finalists, Lorraine Tran, chose to bake a gluten free angel food cake filled with a yogurt-berry mousse (as photographed above). 1. Preheat over to 365 degrees. In a medium bowl, sift gluten free flour, salt, xanthan gum, and 3/4 cups of sugar. 2. Beat the egg whites until foamy. Add the cream of tartar. Beat until the egg whites form soft peaks. Beat in the reserved 3/4 cup of sugar gradually. Beat until stiff peaks form. 3. Slowly fold in the flour mixture, about 1/3 cup at a time, until combined. Once the flour mixture is combined, fold in the vanilla extract, orange extract, and lemon zest. 4. Pour into 8 inch cake pan. Bake in over for about 30 to 40 minutes, until golden brown or until a skewer poked in center comes out clean. Allow to cool. 1. Combine sugar, yogurt, and lemon juice with whip. 2. Combine gelatin and water, heat until melted. 3. Whip cream until soft peaks form. Fold gelatin into yogurt mixture, then fold in whipped cream. 1. Cut cake into two layers. Hold cake firmly on table and with a cake knife slice slowly through the side to divide it into two. 2. Put a layer of cake into a spring form pan lined with acetate liner. Cover it with berries and then a thick layer of mousse. 3. Add second cake layer and garnish with mousse and extra berries for a fresh look. Refrigerate for at least four hours, until set. Remove from pan. 4. To create topping, use homemade or store-bough whip cream and berries to garnish. Or to accomplish the look in the photo, make sure the top layer of mousse is very thin. 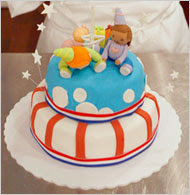 Cover the chilled and set cake with fondant and fondant decor. How cute! Thanks for sharing...I loves me some cake!